Norton announced last week that they're retuning to racing at the 2012 Isle of Man TT. 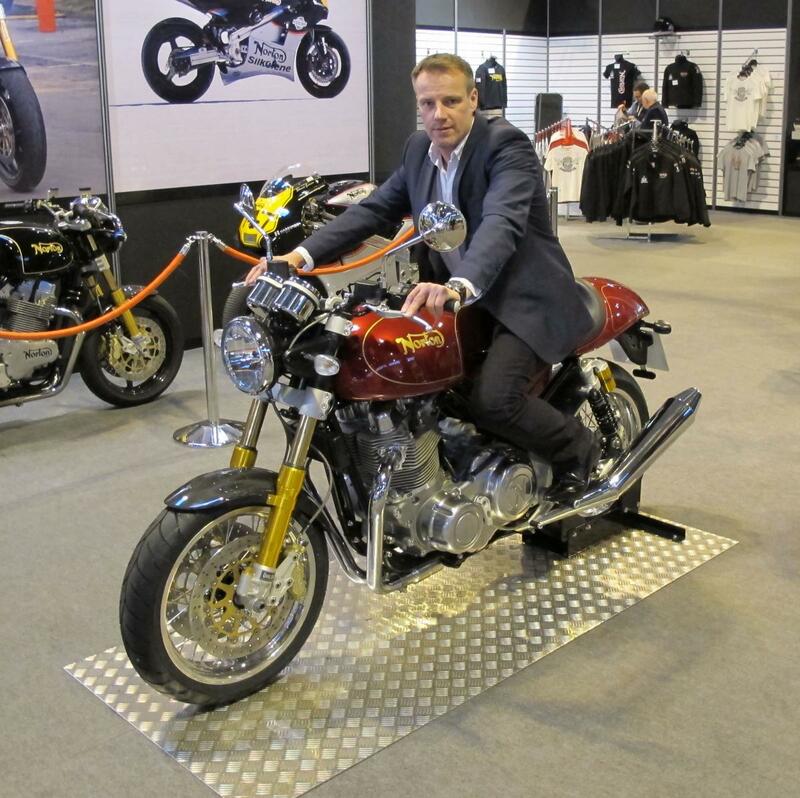 Mark Forsyth grabbed Norton CEO Stuart Garner at the Isle of Man TT launch event to find out what the firm's plans are.. So you're running a Spondon framed Aprilia V-4 at the TT? Not a parallel twin? Or a rotary engine? There's no shame and no secret, It's an Aprilia V-4 motor. We've got the blessing of the Aprilia factory. I had heard rumours that you're building and developing your own V-4 engine? Which is the TT or MotoGP? Yes. In the last two years since we put Norton back together we've been building a strong global distribution network so we've got showrooms in Japan, America and Europe. When you've got a dealer network with such a geographical spread there is no point racing in a single territory. You need a race format that gives that global appeal and global coverage. You're quite right - it's TT or MotoGP. Or wrong in terms of Bahrain? Ha, yes. But they're forward thinking, ahead of the curve and they are where the money is. MotoGP is a difficult thing at the moment, it's got a difficult rule book and unless you've got an unlimited budget it's difficult to be competitive - look at Ducati. If you haven't got the necessary budget you may well be four, five, six seconds off the pace. As a privateer that's unpallatable but OK - but as a company, you wouldn't put your brand in that position. For those reasons MotoGP sort of ruled itself out. Is it all about brand awareness? Is it to sell bikes? Reflating the brand. If we can do that in a commercial way, like at the TT selling some race clothing and developing the bike to the level of the TT makes us budget-neutral, which this exercise is, as a team and a racing campaign. We've had to put cash in to build and develop the bike but when we're there the sponsorship we get and the clothing sales and other associated sales that we get will actually neutralise all of our spend. No other form of racing on the World stage offers us that opportunity. So every which way we tried to skin the cat, 'we want to go racing' it pointed back here. The brand tells us we want to race and all the lads at the factory all want to go racing because we're all bikers. We just had a look at everything that suited the brand, suited the budget, suited our pocket and every road was either stone walled or opened up to TT. Is this the gear-driven cam Aprilia V-4? What stage is the bike at the moment? Mackers (Ian Mackman) had a ride on it - it's circulating, it's running. There's loads and loads to do on it. I joked with the TT organisers today and asked them if they could postpone the 2012 TT by a month. We got a no. We've got the bike. Would we like more time? Yes. Would we say the same next year? Yes. It's racing, isn't it? How long a plan is this then? Presumably there's slightly different thinking in terms of weight distribution, geometry and flex? You're going to be busy aren't you? So the bikes not overheating, it's fuelling OK?